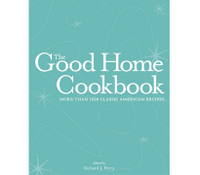 Over at Collector's Press (which is where I have gotten my incredible library of retro books from) they are putting together a new cookbook, "The Good Home Cookbook". I was one of the lucky ones who was able to participate as a recipe tester for this massive work! (I tried out recipes for "Ambrosia", "Baked Apples", "Old Fashioned Tapioca Pudding" and more, just to name a tiny few!). If you would like a peek at some of the recipes in advance or just to read about the creation of this cookbook and the journey it will have taken before it is published in October 2006, just head on over to the blog by Richard Perry, Collector's Press founder, at this link. If you want to get your hands on the cookbook before they are sold out, you can pre-order it at Collector's Press on this page.